The Mouse Connection: Why use a Travel Agent for your Disney Vacation? The service a travel agent provides is FREE! Really! Travel agents are paid a commission by the supplier (Disney) for the travel that is booked. There are no behind the scenes mark ups or hidden fees. Disney, in particular, has very standard pricing and they offer the same rates to all travel agents that they have on their website. You may be wondering why Disney would pay a travel agent if they could book all of the travel themselves? The answer is actually pretty simple - travel agents work to make your trip better. The more fun you have on your vacation, the more likely you are to go back. A travel agent specializing in Disney has knowledge and experience. Not only do specialists have a love of Disney, and lots of experience, they also have taken tests to "earn their ears." (Literally! When I completed the College of Disney Knowledge Disney sent me a set of ears complete with Mortar Board and Tassel!) Specialists also work hard to keep their knowledge current. I often get calls from overwhelmed parents trying to plan the perfect Disney vacation for their families. Let's face it, there are a lot of moving parts to a Disney vacation, from transportation, to choosing from a multitude of hotels, to sorting out all of the ticket options, to finding a place to eat, to figuring out which park to visit on which day, and even down to what to do inside each park. It is a lot to figure out! I like to get to know my families a little bit, figure out the budget, and help them make the most out of their time and budget. A travel agent knows what the discounts are and where to find them. I have worked with many clients who were very surprised when my quote was substantially less than the exact same vacation they priced out themselves. My favorite story is about a family who called and said that they wanted to meet some friends at Disney and knew exactly what they wanted and just wanted me to book it for them. My client was in a bit of a hurry, so I got the pertinent information and booked her vacation. Shortly after we hung up, I realized that what she thought she wanted was not really the best idea. I called her back and asked if she could check in 1 day earlier. She did not have much interest in the idea until I explained that if she checked in 1 day earlier, her entire vacation would cost her almost $900 less! Stay longer for less money - SURE! A travel agent can usually retroactively apply discounts. If a discount comes out after you have booked your vacation, and you otherwise would have qualified for the discount, then a travel agent can retroactively apply it to your reservation. If you booked with Disney directly, you can do this too, but you have to make sure you constantly check for the latest discounts, and then commit to sitting on hold for an hour to get the discount applied. I was just working with a family who was ready to make their final payment and I was able to give them the good news that their trip was going to cost them $800 less than they thought! I honestly get ridiculously happy for people when that happens. A travel agent can save you money in other ways. Personally, I try to spend my clients money like I would spend my own. Sometimes spending a little extra gives you a lot, sometimes spending a lot extra gives you very little. In addition to lots of money saving tips, I try to let my clients know where they should splurge and where they should cut corners. I have on many occasions tried to talk clients out of more expensive vacation packages. While it is absolutely true that the more you buy the more commission I may make, I am much more concerned that at the end of your vacation, you feel like you got your moneys worth. I would rather make less and have you trust me that make more and have you feel like you overspent. You will be much more likely to share my name with a friend, and I will sleep better at night. A travel agent is a great sounding board! If you have ever called Disney directly, and asked whether you should do A or B. You will likely hear something like "Oh, they are both fabulous choices." Well, I have opinions that I will freely offer! More than that, I try to tell you why I like something or not or why I think you would like something or not. To be fair, using a travel agent might not be for everyone. If you are an ultra type A personality in terms of vacation planning (ahem - like me) it can be a little hard to let go of the control. Not that a travel agent is going to "control" your entire vacation! But once a travel agent books your reservation, they have to make changes to the reservation. So if you decide at 9:45pm that you want to add a Park Hopper option to your ticket, then you will need to contact your travel agent to do it instead of calling Disney directly. Also, you should have a good feeling about your agent. There is no "travel agent law" that says your agent must rebook you with a discount if it comes out. In those cases travel agents are actually doing more work to earn less money. For me, my relationship with my client is all about trust. I want my clients to know they can trust me to do the best I can for them. In the long run, I know that working harder to reduce my commission is good for my client, good for my business and good for my conscience. If you do not get a good feeling after your first conversation with your agent, just thank him or her and move on. Now that I (hopefully!) 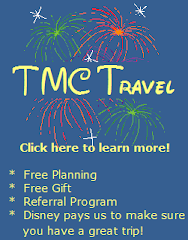 have you convinced that using a travel agent is a good thing, let me convince you why you should use TMC Travel - The Mouse Connection for your next Disney vacation. You deal with one agent. We do not pass you around from agent to agent. We are not a call center. We want to get to know you and use that information to make your trip better! We work for you - not Disney. We are available outside of regular office hours. We work from our home offices, so we have great flexibility! I often meet families in person on the weekends if that is convenient. I have hung up the phone with a client at 11:45pm, once the last dining reservation was made. And if I get an email at midnight I will answer it at 12:15 if I am still awake! We offer free gifts to all of our clients who book a 4 or more day vacation package! We have a lot of "goodies" that can make your trip a little more special and fun. We help you tame the crowds. Believe it or not, there is some science behind which is the best park to visit on any give day. Crowds can swing wildly from day to day for any given park. We try to use our "Disney Crystal Ball" to your advantage! We help with dining reservations or recommendations. With more and more families taking advantage of the dining plan, "Where should we eat?" is a much bigger factor to consider. We are happy to make some recommendations for you, help you find some menus to peruse, or even make dining reservations for you! We keep you organized! We have some great tip cards that are personalized for your trip. Sized to fit in your back pocket or park bag, we will make sure you know park hours, parade times, fireworks times, magic hours, and the dining reservations we made for you for each day of your trip! We also have other great tip cards that cover everything from the best snacks in "the World" to how to enjoy Epcot's World Showcase with children. We accept transfers. If you booked your trip yourself and are unsure about it or just need some extra help, we can transfer your reservation to our agency and help you just as if you were our client from the beginning. And you will still get all of the goodies and extras that we offer all of our clients! We are an "Earmarked" and have EARNED the title "Authorized Disney Vacation Planner"- We are proud that Disney as awarded us with the title of Authorized Disney Vacation Planner. 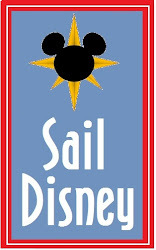 To be chosen as an Earmarked agency, we have attended training classes, visited the parks, cruised the seas and demonstrated a dedication to planning Disney vacations for several years. In addition, we meet benchmarks set by Disney to qualify for and retain our designation. It is truly an honor to be chosen as one of Disney's top agencies. It is a testament to our hard work and our love of all things Disney. And to be fair, I guess I should give you a reason not to use TMC Travel for your next vacation...or at least a reason not to use me. Using me makes you a Disney-enabler. Each trip you book with me only furthers my Disney addition. If you can live with that, give me a call or send me an email and let me help you plan your next vacation!